Cloudy, windy, sunny and, at one point, rainy— the weather on the afternoon of Sunday, November 4th, was ever changing. 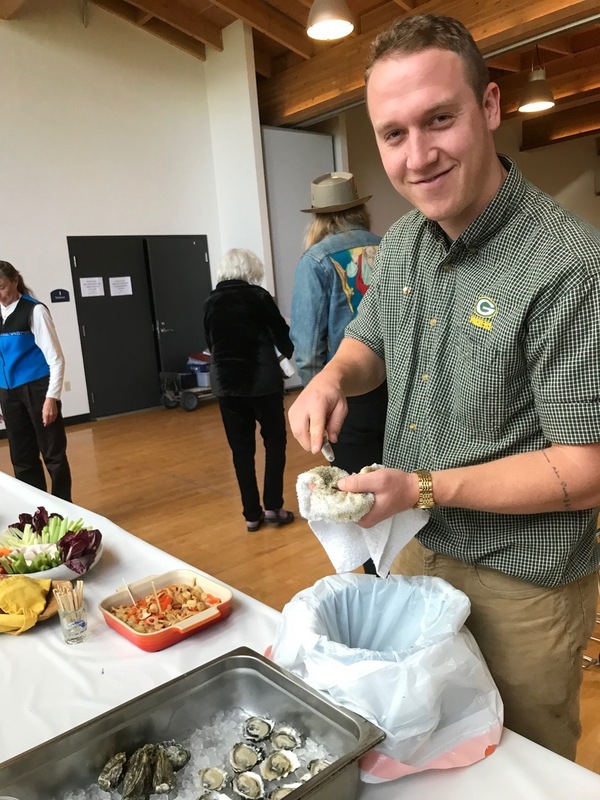 However, the climate inside the Montlake Community Center was warm and welcoming, as an estimated 40 members and friends gathered to attend Slow Food Seattle’s annual meeting and potluck celebration. The food, as anticipated, was truly memorable and ranged from roasted heirloom vegetables and wild-harvested mushrooms to lamb ragu lasagna and shigoku oysters skillfully shucked by SFS Co-Chair Austin Becker. To say that everyone ate his or her fill would be an understatement. I personally went back for thirds. Among the highlights of the day was the introduction of the new SFS Advisory Council. This distinguished group of agronomists, outreach specialists, educators and chefs shares their knowledge, philosophies and practical skills with the board. In addition, SFS Co-Chair Emily White nominated three new Board members, David George Gordon, Kim Abrams-Marshall and Madeline Finch, who were quickly approved with a vote of hands by the membership. These newcomers then took their places, along with existing members — Treasurer and Regional Governor Gerry Warren; Co-Chairs Emily White and Austin Becker; and Kristian Kofoed — on the SFS leadership team. Following the food and formal business, a panel of attendees of this past September’s Terra Madre gathering in Turin, Italy, shared their experiences at this, the largest food-related event in the world. David George Gordon, Susan Balbas, Kären Jurgensen and Peter Contrastano did their best to describe the immensity of the gathering, its powerfully positive influence on everyone there, and some of the unexpected perks of being there. Those benefits included (for Contrastano) a field trip to an historic vineyard, a dinner hosted by Sean Sherman, a.k.a the Sioux Chef (for Gordon), and a pasta-making workshop led by a trio of Italian elders (for Jurgensen). Susan presented indigenous foods at Slow Food Turtle Island’s table, the only booth representing the United States. Those who attended this year’s member’s meeting were well aware of the wisdom of these words. We all look forward to a healthful, productive and fun 2019.